The Danxia landform refers to various landscapes found in southeast and southwest China that “consist of a red bed characterized by steep cliffs”. 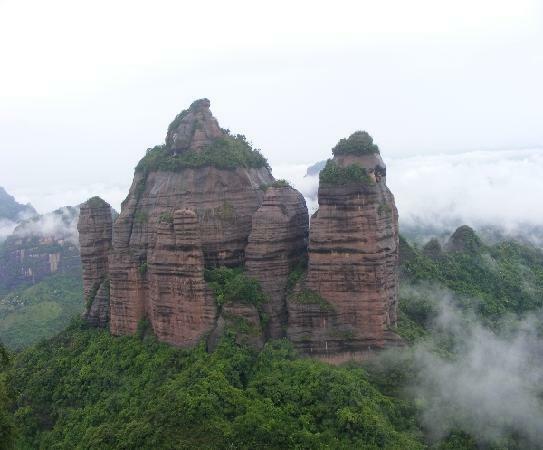 It is a unique type of petrographic geomorphology in China. Danxia landform is formed from red-coloured sandstones and conglomerates of largely Cretaceous age. 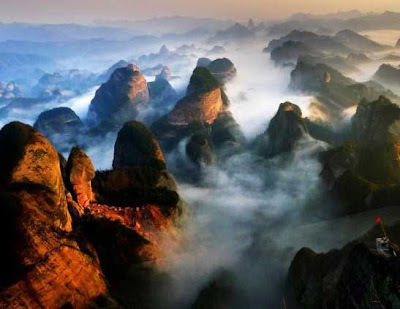 The landforms look very much like karst topography that forms in areas underlain by limestones, but since the rocks that form danxia are sandstones and conglomerates, they have been called “pseudo-karst” landforms. There are more than twenty provinces have Danxia landform in China, but the Danxia Mountain in Renhua County, Shaoguan City of Guangdong Province is the most famous one, and even the danxia landform is named after Danxia Mountain. 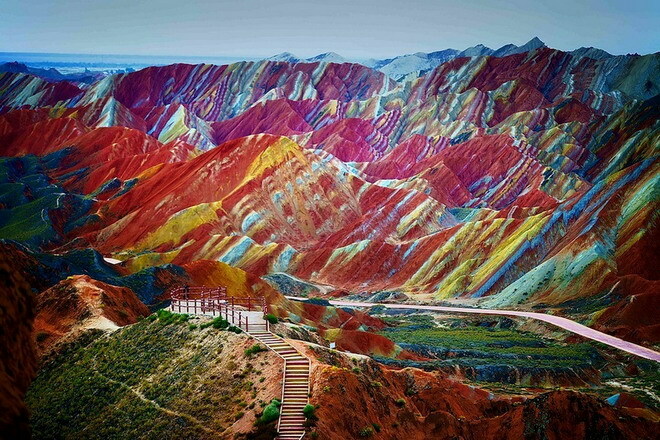 DanxiaMountain, or Mount Danxia, is a national key scenic spots, and also known as “China’s Redstone Park”. Danxia Mountain consists of a dozen red conglomerate Danxia hills. It is the most complete, unique beautiful and typical Danxia landform Among 1200 Danxia landscapes in the world, it is also called “open-air geological museum”. At the same time Danxia Mountain also has some unique stone, such as Yang Yuan Stone, yin Yuan Stone, Breasts stone, Sleeping Beauty and other attractions. 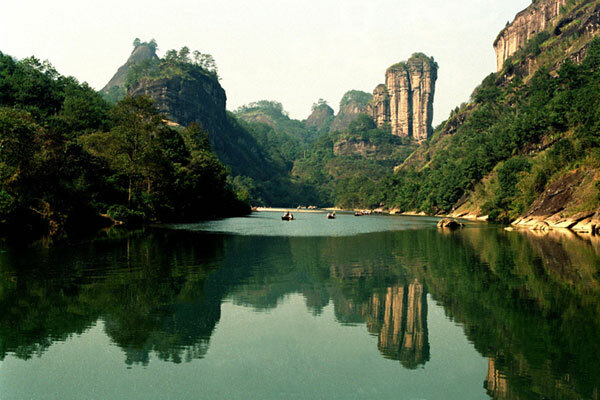 Located at Junction of north Fujian and Jiangxi Provinces, Mount Wuyi is among the first group of China’s top tourist destinations, as well the fourth natural and cultural heritage in China. 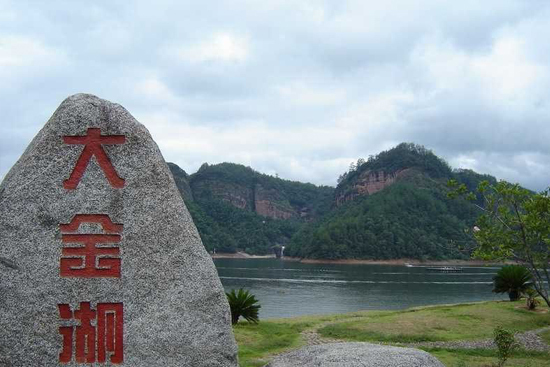 With a pleasant climate, fascinating scenery, abundant products, time-honored history and rich tourism resources, Mount Wuyi is a famous tea, grain and timber production center in China. It is a typical Danxia cuesta, massive mountain and columnar mountain, standing near the water. Please see our Mount Wuyi tour packages, join us! Dajin Lake is consisted of four unique styles of small basins. Clear and green lake and surrounding different styles of red mountains constitute the perfect combination of dynamic and static landscape. It is well-known as “the first hills”; some of the scenic mountain is rather old, so it is also the oldest Danxia landform in southeast coastal area of China. A large number of strange caves and honeycomb caves can be seen everywhere in the scenic area. Caves are large, strange, with different patterns and are called “Danxia landform Cave Museum”. Located at 20 kilometers southeast of Yingtan City, Jiangxi Province, Mount Longhu, or Longhu Mountain, is one of China’s four famous Taoism Mountains, as well as the best and most complete Danxia landform in China. The mountains, caves, and rocks in the scenic area constitute its complete and unique Danxia landform. Bajiaozhai village is located in Guangxi Autonomous Region, while the Langshan Mountain is in Hunan Province, but they are quite close to each other. Bajiaozhai Village is also called Yutai Mountain, of which corner has dangerous, towering, majesty, wonderful, beautiful, and natural characteristic, one of which is called “Longtouxiang” and it is suspending in the air, it looks like a dragon which is going to fly. Bajiaozhai Village was evaluated as one of the beautiful Danxia landforms in China by the China national geographic in 2005. It covers more than 40 square kilometers and its landform shape is developed richly. Honored as “soul of the Danxia landform” by the concerned experts, the Bajiaozhai Village is worthy inspection. 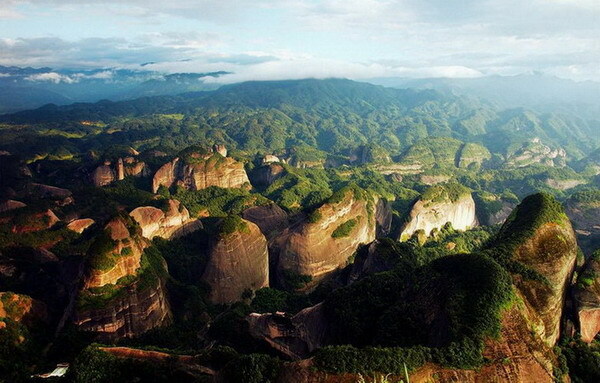 Langshan Mountain is one of China's National Geological Park and famous for its unique Danxia landform. It is located in Xinning county, Hunan province. 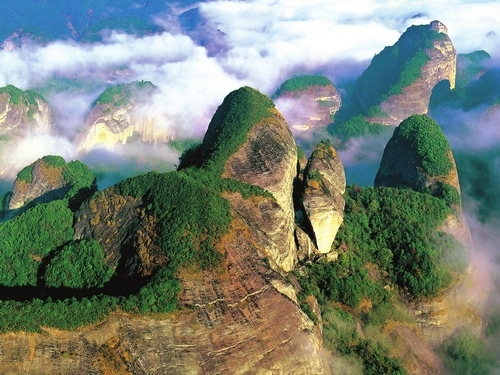 In the south Langshan Mountain is connected with Guilin, in the north it echoes Zhangjiajie. 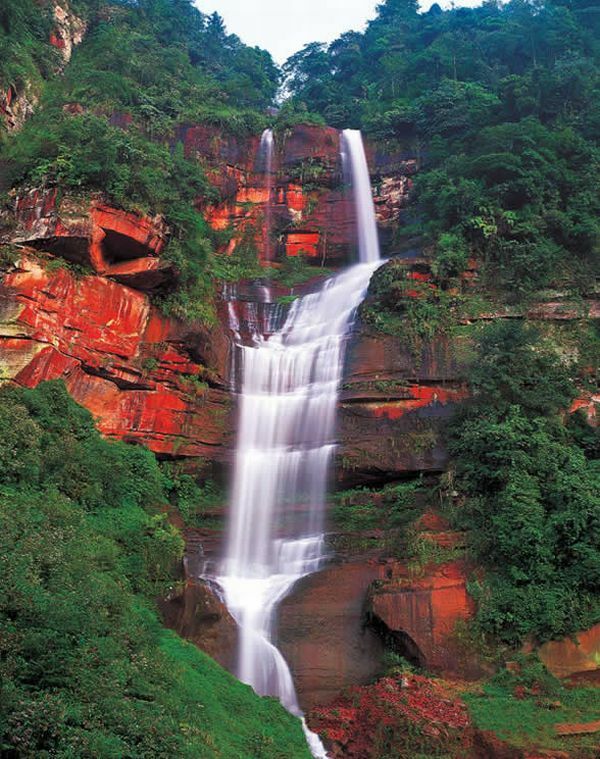 Covering an area of 108 square kilometers, Langshan Mountain has rich natural scenery and abundant tourism resources. There are more than 60 scenic spots in Langshan Mountain. Among which the most famous are Tianyi Lane, Chili Peak, Zixia Cave, Fuyi River, Innate Bridge, Bajiao Stronghold, Emperor Xun Forest Park and Xicun Ancient Dwelling, etc. Zhangye Danxia Landform is major features quaint, colorful and magnificent, and based with isolated peaks and steep rock formations, including colorful gorge, colorful tower, colorful lake, as well as colorful many other wonderful scenery, both have southern and northern charm and style. Danaxia landforms are colourful rock formations at the Zhangye Danxia Landform, a unique type of petrographic geomorphology which is found only in China which consists of red-colored sandstones and conglomerates of largely Cretaceous age. Chishui Danxia landform has bright red red cliff, ​​narrow ridge, spectacular rocks and mountains, huge rocks gallery cave and beautiful danxia canyons, together with green forests and waterfalls, forming a unique Danxia landform.